With words like Tide & Flesh you kind of wonder where people would go this week. One reason I didn’t put an Opening Haiku in the actual challenge post was so as not to influence people’s thoughts. My personal contribution this week can be viewed as being of a human nature or from that of those of an animal in nature. The image gives one a thought, but those thoughts may be wrong. That’s the great thing about Haiku. The skins can be baked. Brand Spankin’ New this Week! Daniel Schwamm: Redeeming Flow | Musing Life’s Mysteries. Great Haiku. Seriously. And from the comments and just the general feel of the blog I get an energy from this guy. I’ve taken select parts of his About page to share, but you click HERE to see the rest. Seriously. “A human being in all the complexity and uniqueness that being human involves. Think with me. Share your thoughts. Annie: Cleansed | Gentle Kindness. Love that middle line. “This is my blog and I have become quite attached to it. I think that bloggers come alive and discover their true inner voice when they nurture and water their blog on a regular basis. It takes on a life of its own that you could not have foreseen when you wrote that very first post.” So that’s part of her About page and I agree with what she says. If you’ve read my blog long enough you know that already. Peter Bouchier: Drifting | Wherever I lay my pen, that’s my home. The title is mine, of course. And it fits what I saw the two events occurring. Or at least I saw two events, but then I am a Gemini, whatever that means. Peter comes to us through Jane Dougherty, as he reblogged her offering this week and provided one of his one at the same time. Thus I decided to throw him into the mix. Nagrij or (Greg Pierce) yeah, I snooped. (Author): Halloween | Nagrij Writes the Hits You Never Knew Existed. (Coffee infused it seems.) 🙂 Swarming flesh? Well kind of. OOoooOOooOOOoOO. Okay, I’m better now, back to normal. Okay so no info on the Nagrij. 🙂 But, apparently a person of their word. They said they would give the challenge a shot and they did and they did it well. So I snooped and found some stuff. You can check out the list of books on Amazon by clicking the Author link above. First to enter the Flesh Tide this week! Annette Rochelle Aben (Best Selling Author, Radio Show Host): Talkin’ Dirty Laundry | Annette Rochelle Aben. She’s stuck in the pun zone since last week. It’s a scary thing. Check out Annette’s books at the Author link above and her Radio Show at the Host link. @YouAreTheExpert A side note here. I was able to catch her Friday show and connected with her author guest. Very intelligent guy and I now have a book to review, a friend on Twitter, and an enemy in College Football, especially after Saturday’s game results. Very nice man by the name of @ph_solomon And you can catch his interview with Annette by clicking here, and I’m the one in the chat room that asked the question Annette asks him. Kat: Boxed Out? | like mercury colliding. I dare you to count ’em all. She pen the med oh, against the times. Clarence: Lovers Touch | PrarieChat. oooo Clarence, you devil. And a second one would be Dream Catcher. Ah, nice take on the flesh prompt. Good turn there, dude. Melissa Barker-Simpson (Author): Pound of Flesh | M Barker-Simpson. Who thinks it’s cool how Mel relates the Haiku challenge prompts back to her Work In Progress? 🙂 I think I might be scared. Click the Author link above to visit her on Amazon. Sandra: Numbers | Wild Daffodil. o,O Only Daffy the Wild One would do something like this. Tsk tsk tsk. (Some of you may have read my recent post Make the Most of Your Post. Well, Delicious Daffy does exactly what I talk about in that post. Dr. Kottaway: I gotta say it up front. I always want to say Mr. Kotta when I see her name. Don’t sweat it, I’m not a hog. (How many of you got any of that?) 😉 Okay, now to the Haiku. Fresh flesh | KO Rural Mad As Hell Blog. Some of you may not be familiar with the good doctor, but well, that blog title should tell you a lot. This is one disturbed doctor. I so am not going to her. Nope. And such a nice photo too. But then that makes even more disturbing. So actually excellent! Had to give her a difficult time there. It’s been a while. Olga: Ever Lasting | Stuff and what if. I at first read the final line incorrectly. That’s what I get for doing these Reviews when tired and in the middle of the night, but then I’m always tired and there is no day or night for me. If you know me then you know what I mean. But that incorrect reading is why I read the Haiku several times before I type anything. Then I think about it, and then I dig when the words warrant it. For this one I feel a personal connection to it in that no matter what happens to me in my ailments, that last line is something I hope is real for me. Elusive: Powerlessness | Elusive Trope. Back to nature with this one. And I mean that in many ways. denis1950: Feeding with the tide | Haiku hound. As always we have some great photos with the Haiku and I like the explaining of what is in the photos. By the way, he continues with the 3/5/3 form of Haiku here. The Jane Dougherty Gang: Click HERE for the Haiku post. And the poets’ names below for their personal blogs. Yes I know she has an entry above but this is for other poets who posted in her comments. She wanted to share their efforts with us. From Published Author Harriet Goodchild there is The Tideline Taking and from Peter Bouchier we have Drifting. Peter appears in the New section at the beginning of the challenge, as his Haiku appeared on his blog. And wouldn’t you know, Jane also joined in for a third go with Crab Delight. Ruby Manchanda: Tides rush in | Whispering Thoughts. Ruby got some praise this week. I see, I can’t exactly say what I see imagery wise with this one, but I think that sort of actually says a lot. Once you read it you might get what I mean. Steven: Flow | Ramblings of a Drabbling Mind. Ha, not creepy unless you do “at your own peril”. Muahahahaha. 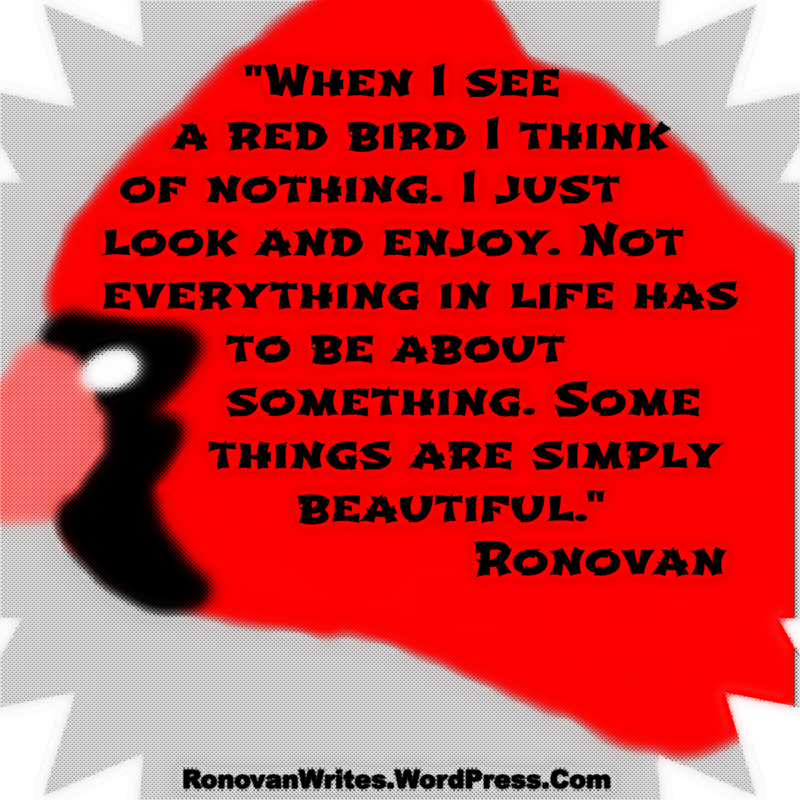 Mine (Ronovan): Tide to Love | Ronovan Writes. Some say it’s about people but oddly it is also about nature and what tides bring in and take out of the lives of those dependent upon it. We have a few authors who are members of our Haikumily here. Click the RED Author link next to their names to go to their Amazon Author pages. NEW! vronlacroix Phoenix |rimons33.wordpress.com Not the use of the word red in Phoenix you might think. Cool. stu0sbloc9: Sunset | Pitter Patter Poetry A great deal of imagery in this one and symbolism as well. Olga: Phoenix | odaciuk.wordpress.com Ah, but not the phoenix you’re expecting. Muahahahaha. Evil laugh, evil laugh. Pat B.: Beautiful Tom Turkey Struts His Stuff | aseasonandatime.blogspot.com You may not realize how gorgeous a turkey can be, and I don’t mean on the table at Thanksgiving. Go check this out. Vashti Quiroz-Vega (Author): Writer’s Block| The Writer Next Door I think she’s in denial. But whatever else she is she Vashti is one of our resident authors. Click the Author link above to visit her Amazon page. Clarence: Casting Call| PrairieChat & Flashy Fins| PrairieChat Looks like Clarence went back in time for both of his entries this week. Claudette: A Clear Blue Day | ceenoa.com My son’s prompt words seems to have come in handy for some with their images this week. Melissa Barker-Simpson (Author): Wings of love | Melissa Barker-Simpson Inspired to write by Colleen’s offering this week. Click the author like for Melissa’s Amazon Author page. NEW! Maylian Leo: Calling Passion & Natures Formation | personalselfperfection I say Maylian Leo even though the link says anonymous because the copyright on the poetry has that name. Definitely kept with the nature aspect of Haiku. Very peaceful offerings. Enjoyed. BeckyG: Rather Red Than a Blackbird on Your Head: beckygblog.com Very nice take on the prompts and loving that background photo on the blog. Shailzaa: Red Bird Waiting?| fewunsaidwords.wordpress.com Very interesting and original take on the prompt words. Good structure and uses the nature aspect of Haiku. 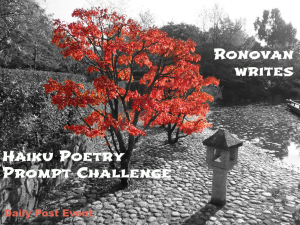 If you do not see your name below and you did write a Haiku for the challenge, please leave a comment and I will add you to the Review. I may have missed the link in the comments section of the Challenge. I did visit the sites of those who participated last week but may have missed a post. Thank you for your participation. If you see Roundup in the Title, that means I just couldn’t do comments this week for everyone due to health issues. Review means comments. 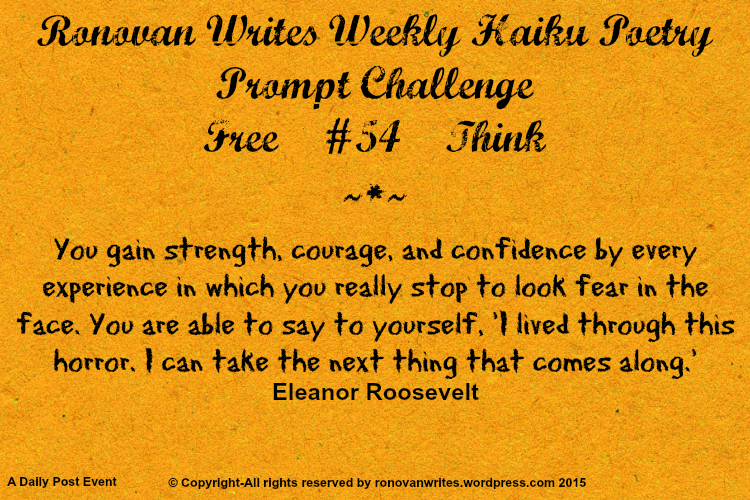 Week #54 Haiku Challenge Review of the Words Free & Think. Be aware all links and images if clicked will open in a new window. Links are in blue and usually underlined. I believe they look cleaner and nicer this way rather than having a URL showing on the page. Pat B of A season and a time: “Some of my current interests besides my family, church, and family history include the following: browsing thrift shops and antique stores, trying out new recipes as well as coming up with a few of my own, playing the piano, learning about my DNA and my health traits, and doing research on various topics.”~Just a taste of her About Page. The Haiku: The Parent Plunge. My name for her Haiku and one that doesn’t even come close to giving away what the Haiku is about. The photos she used to go along with the Haiku are her own and I have to say WOW. Am I so envious she had this experience. Sue Vincent from Daily Echo: Free. I think of the title The Lie when I read this one. Looking at the photo with the boundaries in the distance give visuals to the words. Very nice. Sue is one of our resident authors with a LOT of books on Amazon. Click here to check them out. @SCVincent But Check out her NEW BOOK. Available in Paperback and for Kindle. Clarence Holm of PrairieChat: Fiscal Expediency. Ew. Just ew. 🙂 And a second one that is not Ew at all, Minnesota Morning. Olga of Stuff and what if…: Miracles. I have several reasons for the title choice. But one is the idea of last two words in that second line. I wonder how often people feel they really can be that. A whole society like that would be a Miracle. Ruth of Mad Meandering Me: Disappointed. So many interpretations for this one. From the silly to serious. Suzanne Miller of Art and Life: Thinking with the heart. Whoa, talk about an informative post. Not just a Haiku here. Read and enjoy. Johnoii of johnorzehowski: Limitation. Very interesting nature Haiku. Something to think about. clickerwriter of Captured by Aishwarya: The end Spring cleaning maybe? Yard sale? Hmm. Steven Walsky of Simplicity Lane: A mountain gives forth. A Haibun by Steven. Another one of those jealous moments for me. Check out and get Simplicity Lane free, go here for where you can get it. Through a Stranger’s Eyes here and Résumé for Love for free here. Swatiu of imgrowing: Unfettered. Considering the prompt words, I think the title says it all. But what all does it say? Shailzaa of Fewunsaidwords: Ego Destroyers. That last sentence kind of made me think a bit. Claudette of to search and to find happiness in every day: Delusion. Definite true message. Canaf of Faithful Devotionals: True Freedom. A freedom that is less and less apparent these days. Awesome image! Skybright1 of from heart to head: Memories. Somewhat romanticalish. 🙂 I made up a word. My Haiku: The greatest opportunity. 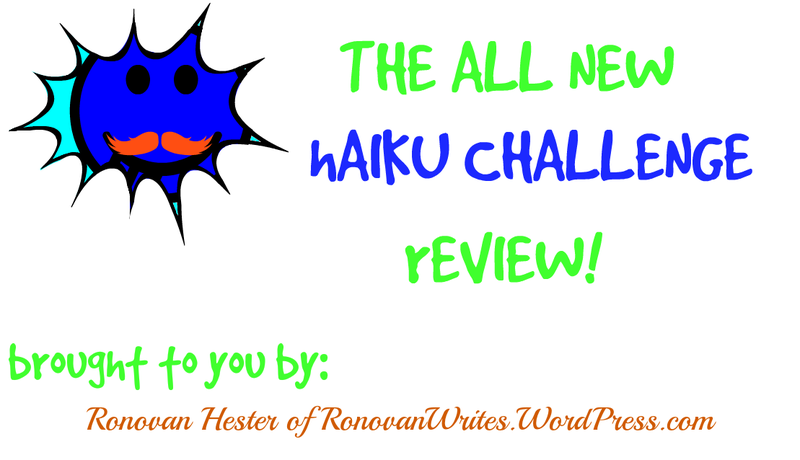 The Haiku Challenge Explained 4: Review and Ronovan’s Choices. What many people who read the Challenge Post don’t realize is there is a Review or Roundup each Sunday. You see the Challenge runs from 9:00 AM EST Monday until Sunday Noon EST. Shortly after Noon on Sunday I post goes out that includes the names, blog names, and Haiku names and links and Twitter Handles of all those who participated. If 5 people participate a post goes out, if 50 participate a post goes out. A Review includes my comments of either opinions, feelings, or fun teases about the Haiku. I have no shame and enjoy being goofy with this and being very honest and serious as well. A Roundup does not have the comments due to time or health. Yes, I have health problems that interfere with do all I would like. First Timers will appear at the top of the post with information from their About Page to introduce them to the community. First to Enter for the Week and appear in the comment section on the Challenge Post will be right below the New Participants in a prominent manner AND will be reblogged onto my own blog to be shared with my readers and thus my Twitter followers. From there each person is listed in order of entry. Authors have it mentioned they are authors and links are provided to their Amazon pages. Etsy Shop pages are linked to as well as any other blogs of the participant like one lady has a photography business. I pick one Serious Haiku and one Humor Haiku each week that grabbed me for some reason. My humor has a broad range and as always with any type of award this is an opinion. Sometimes the choice comes down to proper Haiku structure, it gets that close. And yes, I do at times have ties. Just as I give an Example Haiku with the Challenge Prompts, I also do a Closing Haiku with them. I then share the Review on Twitter and Google+ on Sunday and Monday. Every member of the Challenge should pay a courtesy visit to the other members. I notice some do this. Yes, it takes time, but it is nice to see how others think and to support others with some views, and likes and comments if you do actually like the Haiku and want to comment. Notice I did say SHOULD. You don’t have to visit, but it is nice, and no one knows if you don’t. If you do like it a lot, share it wherever you like to, Twitter, Facebook, Google+, wherever.